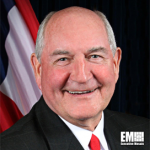 Secretary of Agriculture Sonny Perdue has announced a $345.5 million U.S. Department of Agriculture investment in 20 infrastructure projects aiming to support rural electric service across 14 states. USDA is investing under the Electric Infrastructure Loan Program that finances projects on energy conservation, system development, generation, transmission and distribution in communities with a maximum population of 10,000 residents, the agency said Monday. The program also allots $7.9 million for smart grid technology that encompasses computer applications, two-way communications, geospatial information systems and other tools that work to streamline and support the reliability of electric power systems. The projects will take place at rural communities in the states of California, Colorado, Florida, Georgia, Illinois, Kansas, Minnesota, Missouri, North Dakota, Ohio, Oklahoma, South Carolina, South Dakota and Wisconsin.